CINCINNATI - When city and county leaders meet on Monday to decide who should build a concert venue at The Banks, the issues before them are much bigger and more complicated than who can attract the best bands. The Cincinnati Bengals have threatened to veto the deal if the concert venue is built on lots they use for tailgating near the stadium, according to Cincinnati City Councilman David Mann. And Mayor John Cranley is questioning whether the city should spend $10 million on a new parking garage for The Banks concert venue because, under an agreement with Hamilton County, the city won't get to keep any of the parking revenue. “This has obviously pivoted from … who is cool enough to attract the right talent for the right demographic, to something that is much more about real estate regulation and legal agreements,” Councilman P.G. Sittenfeld said at Wednesday’s council meeting after these issues first surfaced publicly. “So we’ll begin the discussion," Mann said. "I doubt that we’re going to conclude it." 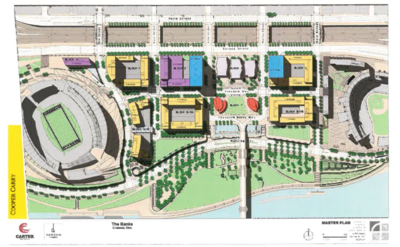 The proposed future development at The Banks, including Lots 23, 27, and 28, which the Bengals oppose as the future site of a concert venue. In May the Joint Banks Steering Committee selected a joint proposal from the Cincinnati Symphony Orchestra and its music management firm, MEMI, to build a $19.25 million concert venue on the riverfront. But this is just a recommendation. The Hamilton County Commissioners and Cincinnati City Council have the final say on who builds the concert venue. Both groups are set to meet on Monday. After the two losing competitors — Live Nation and Columbus-based PromoWest -- questioned whether they were given a fair chance to compete against CSO’s hometown advantage, Mann invited all three to present their proposals at city council. Live Nation has since dropped out of consideration. Monday’s meeting was planned for city council members to watch video presentations of what a new concert venue at The Banks could look like. But then Mann met with Bengals' director of business development, Bob Bedinghaus, on Wednesday and learned the team may veto the whole project. Mann said Bedinghaus told him the Bengals have issues with building a concert venue or expanding green space on Lots 23, 27 and 28 – which both PromoWest and the CSO had planned to incorporate some portion of in their concert venue plans. The Cincinnati Symphony Orchestra's plan for a concert venue at The Banks will leave green space for the Cincinnati Parks to develop further. Now Mann has invited Bengals lawyer Stuart Dornette, as well as Tom Gabelman, Hamilton County's counsel for The Banks project, and Phil Beck, The Banks’ project executive, to Monday’s council meeting. “While we have concerns about the proposed location, and have shared them with others, our goal is to work through these issues and move toward a positive result. We’ve had discussions with the Hamilton County commissioners and administration as well as representatives of the CSO, the city and the Joint Banks Steering Committee in an effort to play a productive role in the music venue project,” according to the Bengals statement. The Bengals have a right to veto the project, according to a memo Solicitor Paula Boggs Muething issued to city leaders on Wednesday. “Analysis of the Bengals lease and related agreements indicate … the county is subject to restrictions that would put the county in default of its lease with the Bengals if it agrees to the proposed music venue on Lots 23, 24, 27 or 28 without Bengals’ consent,” her memo states. Specifically the county is prohibited from allowing construction of a building taller than three stories or an auditorium with seating capacity of more than 3,000 on Lot 27, the memo states. The CSO had planned to build its indoor venue to hold up to 4,000 people on Lot 27 and preserve the rest as green space. It also proposed a temporary stage set up on city-funded parkland. The Banks master plan for development. PromoWest also planned to build their venue on Lot 27, with indoor seating for up to 2,500. It also proposed lawn seating for outside concerts that could attract 4,000. Their plan would use all of Lot 28, and portions of Lot 23 as public space. If the Bengals don’t give consent they “could pursue litigation against the public parties and even if they are unsuccessful, the Bengals could delay the construction of a music venue at The Banks for several years,” the city memo states. While the Bengals do not oppose building a concert venue on Lot 24, Mann said he believes the Joint Banks Steering Committee does not want a music venue in that spot. The other contentious issue that has emerged is the parking garage that needs to be built to support the concert venue. Cranley doesn’t want the city to pay for half of the parking garage construction and get none of the revenue in return. “I believe that we should have direct negotiations with the Bengals for the sole purpose of under what conditions we can get them to agree to a music venue at the Banks,” he said.